This element is extremely important for the functioning of our body as a whole, and the quantity of zinc in the body is found in only a few grams. Experts point out that foods rich in zinc are very important for goodb health, because even a small deficit could cause a catastrophe, which is why it is necessary to constantly enter this mineral in the body, especially during winter, because the mucous membrane of the nose and throat creates a barrier that prevents the flu virus to penetrate the body. Hereinafter, find out what is the role of zinc in the body, why is it good, what foods are rich in zinc and selenium, etc. Zinc in the body stimulates the production of white blood cells in the bone marrow, as well as the maturation of the so called T-lymphocytes, which are necessary for the defence of the body against many pathogenic germs. In addition, it prevents inflammation and suppresses viruses: does not allow the virus to multiply and to enter over the respiratory mucosa into the body. Foods rich in zinc and selenium will help to prevent infection, but to faster and easier deal with infections that have already occurred, such as colds and flu. People who have a chronic shortage of zinc in the body are more prone to malignant diseases, as this remarkable mineral acts as an antioxidant (neutralizes the effect of free radicals thereby preventing the occurrence of cancer). In addition, the mineral zinc encourages greater production levels, which is extremely important for people who are suffering from cancer and are subjected to radiation, which reduces the number of red and white blood cells. Immunity of persons who have a zinc deficiency is impaired, which is another factor in the risk of malignancies. The disadvantage is associated with ovarian cancer, breast cancer, lung, intestine, skin, and leukaemia. Zinc in food is therefore extremely important, as will be discussed later. The human diet is based on foods that do not have nearly enough vitamins and minerals. Zinc deficiency causes the appearance of white spots on the nails, the tendency to frequent colds and infections, dryness and ruff of skin, stiffness of hair, dandruff. If you notice that your sense of taste and smell is getting poorer, you lose your appetite and lose weight rapidly, you have diarrhoea often, your eyes adapt to the dark with difficulty, wounds slowly heal, you are prone to skin irritation, dermatitis and acne - these are clear signals that you lack zinc in the body. The lack of this mineral can cause disruption of growth and development, concentration and memory, as well as impotence and infertility in both sexes. One of the symptoms mentioned, of course, is not sufficient to cast doubt on the chronic lack of zinc in the body, but if you recognize yourself in several of these symptoms, especially if they last longer, it does not hurt to check the level of zinc in the body and to increase the intake of foods rich with this element, because foods rich in zinc can be your most important ally and exceptional friend. Foods rich in zinc and vitamin C.
Zinc in food is very important for the functioning of the whole organism. All vitamins and minerals should primarily be delivered through natural sources which is food, and this mineral is better absorbed from animal foods - eggs, meat (beef, turkey), seafood (mussels, clams, tuna ...). Of course, by no means should we be negligible to plant sources of zinc, which are really a lot and many times are useful for human health: nuts, particularly almonds, beans, wheat germ, whole grains, pumpkin seeds, spinach, brewer's yeast, beans, peas. Altogether, these foods are rich in zinc, magnesium and selenium. In addition to participating in numerous metabolic processes, zinc has a very positive effect on the nervous system, skin hair, vision. Zinc and vitamin C are a very powerful tandem, because together they are a powerful weapon to fight infections because the immune system becomes much stronger and more effective. This combination is especially recommended during the cold winter months, as a very useful protection against a number of aggressive infections and colds. Also foods rich in zinc supported by vitamin C are recommended after injury, surgery or burns, as it helps the mucous membrane, skin, connective tissue and bones to recover faster. The composition of all of these tissues is collagen, and vitamin C and zinc are crucial for its synthesis. Therefore, this powerful combination is recommended a few weeks before and after surgery. The powerful antioxidant properties of zinc helps to eliminate toxins and prevent their accumulation in tissues. Neuro degeneration and Alzheimer's disease are directly related to toxins and heavy metals that accumulate in the brain. Foods rich in zinc help maintain brain structure and health of the central nervous system. It has been proven to have a positive effect on the development of the baby's brain, and it is important to take zinc during pregnancy in sufficient quantities. Some studies have confirmed the importance of zinc in the treatment of hyperactivity and attention deficit disorder in children. According to a study published in 2009 in the journal of Clinical Nutrition, zinc in food has an essential role in the proper functioning of the thyroid gland. Without zinc, thyroid gland cannot convert inactive hormone T4 into active hormone T3.1. The hypothalamus needs this mineral to produce a hormone that is necessary to signal the pituitary gland to activate the thyroid gland, which means that people diagnosed with the lack of zinc in the body are most likely to suffer from slow work the thyroid gland. Finally, foods rich in zinc are necessary for the creation of reserves because insulin promotes its operation. Zinc-insulin complex is located in the pancreatic cells, and when the body does not have enough of this element, there is a disturbance of diabetes management. Suppose also that the amount of zinc in diabetic pancreas is twice smaller than normal, and this has an effect on difficult wound healing in these patients. This precious element is essential to the health of the testicles, and the optimal number, shape and motility. It also protects DNA in reproductive cells, prevents them from damage and increases the chances of fertilization. When the sperm enters the female reproductive tract, the mineral zinc is degraded rapidly and allows the sperm to move faster toward an egg cell, and helps to protect the enzymes necessary for the process of fertilization. This mineral is also known as the protector of the prostate. 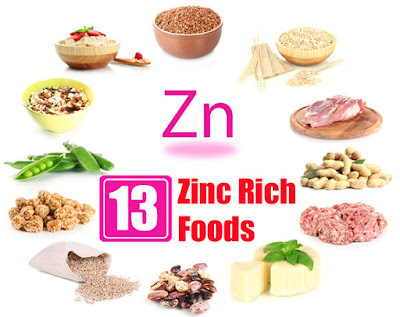 One of the key elements for the treatment of its improvement are foods rich in zinc which are proven to reduce the risk of cancer of the gland. In addition the power of this element if it is taken in optimal doses is to, strengthen hair and nails, prevent the formation of dandruff, reduces the risk of allergies and skin appears shiny and healthy. Also, if you regularly consume foods rich in zinc, it will help faster wound healing. Zinc in the body is an important element for the proper functioning of sweat glands, and is effective in the prevention and treatment of acne. Since it allows vitamin A to produce the pigment melanin, which protects the eyes, this metal is associated with improved night vision. Given that the mineral zinc is powerful and potent antioxidant, effectively prevents the formation of free radicals, even in the eyes, and thus protects from diseases. In order to preserve eye health zinc tablets from 40 to 80 mg are recommended per day. We hope that you at least learned what is the role of zinc in the body and what are foods rich in zinc that are beneficial to our health.